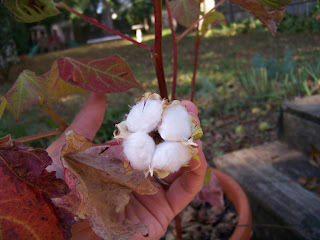 The first cotton boll bursts open. Here in Kentucky, we grow cotton on the back 40 and it's ripe now. The bolls, like enormous acorns minus the caps, become too full to hold their contents, and burst one by one into puffy white quatrefoils. It's quite a sight. Okay, only kidding, sort of. 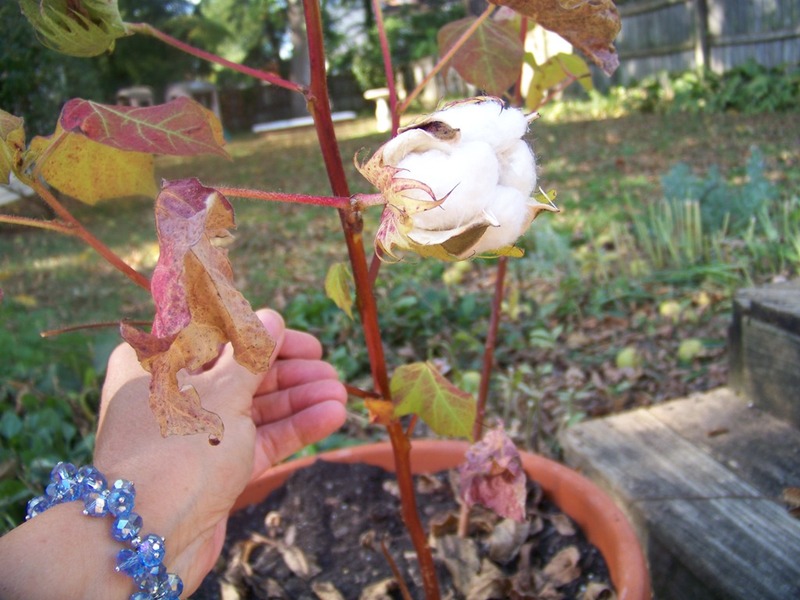 Yes, we are growing cotton, but in two large pots in the back garden, so our crop is minute, a jar full of fresh, soft cotton balls, perhaps, and enough seed for a short row next year in Mamaw and Papaw's much larger garden on a real back 40 acres. Curte was keen to show the boys two iconic crops from Georgia, where we both used to live, so we have both cotton and peanuts back there. It turns out his grandfather did grow cotton, for real, here in this state, where I never knew it to be farmed. It was for home use, I understand. Now, I knew his Mamaw (grandmother) made their clothes -- I have her treadle Singer machine -- but did she spin, too? Unsure. She was a big quilter so I am betting the crop was more for sale and for batting to fill quilts and pillow or mattress ticks. Must ask. So is the cotton a veritable sight? It is, in veritas. 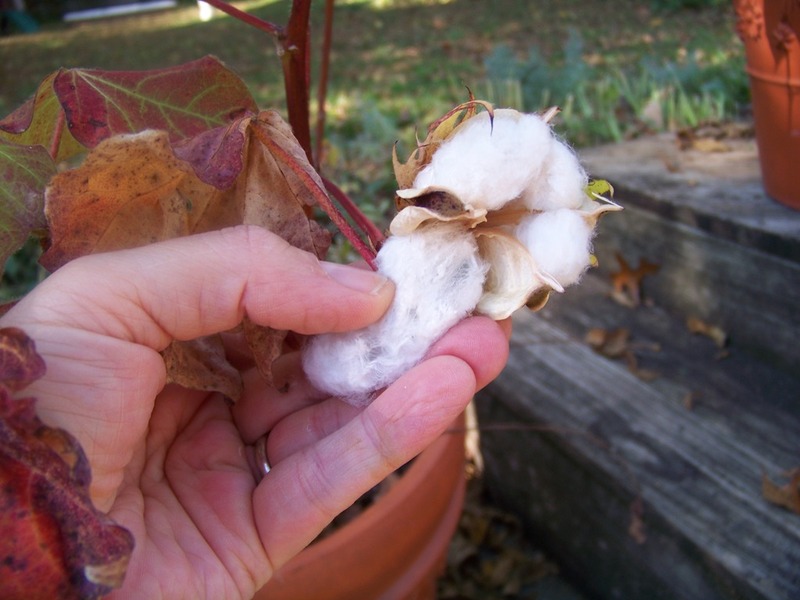 The plants themselves are all shriveled and stalky and unattractive, and their rough leaves harsh on the skin, but those bolls and the pure, pure, pure cotton, its surface faintly sheened, a wee bit like silk in a mellow yellow October light, all balled up inside. Come see! Look for two cotton bolls in this blurry photo. Here in the garden, almost all of summer's flowers are cut or pulled, the leaf mould underneath working its way into the ground, and black walnut leaves are fluttering down by the hundreds every few minutes. Our tree will be bare too soon. The walnuts come carronading too from the branches, their great size and density enough to raise a bump on a person's head, or to really injure a small child. The boys may not play back there without their helmets. 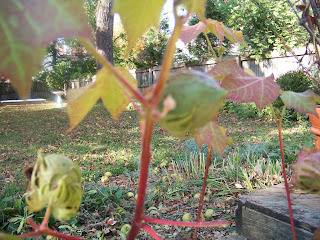 But here's a cotton stalk, bearing two bulbous bolls, acorn-shaped, as I wrote earlier. Here is the brother boll, burst, cupped in my hand so that you can see it is indeed big. 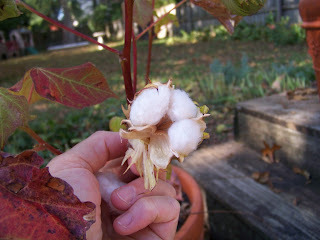 The four-sided husk, when it opens, pulls the cotton into four separate puffs. Let's pull one out, shall we? A gentle tug to release the cotton puff. ...which is sorry, I am sure, to lose part of itself. I will take the rest before the next rain. Do you see the faint glow on the fibers? Detect their whiteness, note that the fibers are all balled up, truly balled up inside, not lying all flattened and ready to spin, no, not by a long way. Here, let me stretch out that puff for you to inspect. You see, some fibers when I pull them, show that they have grown parallel to one another, but not all do. I must inspect other puffs to see what they do. However, this puff that I now hold in my hand, late this evening, under the lamp, why, part of it looks just like a pharmacy cotton ball, it's that tangled, but other bits are in parallel groupings, like wool roving, really, only the fibers are so short, that when I pull on each end, the roving readily narrows and thins. I have yet to measure the length of an individual fiber to understand the staple -- the fiber length which will help to define how the cotton will behave when woven -- must do that tomorrow. 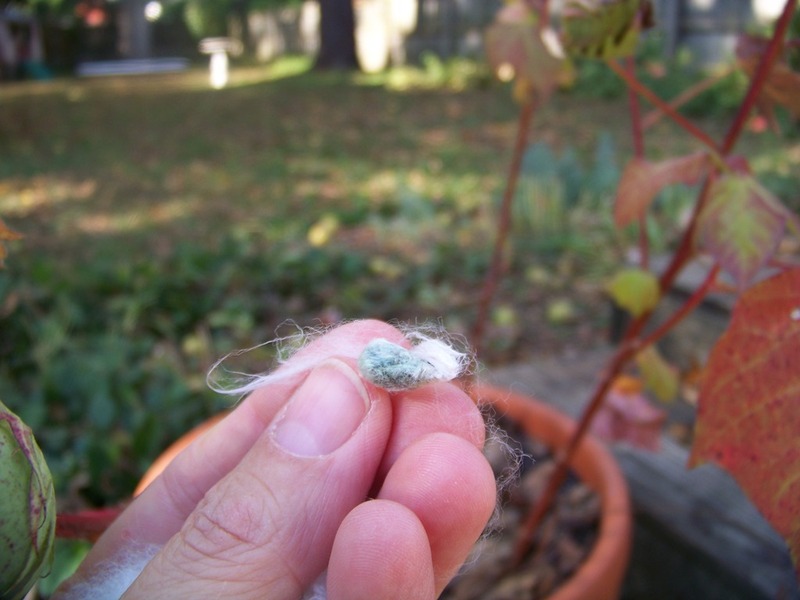 The puff is lumpy, so I tease apart the fibers, and they give me some resistance; they do not like to come away from their seeds. Here's one. It's big and greenish and roughly a triangular shape, each edge rounded, and as long as my pinky finger nail, perhaps 3/8" inch. The fibers appear to originate with the seeds? For they grow on it and the close ones are too tightly on there for me to even rub them off, and they grow on it like hair on a head. I find some seven seeds in just one puff; thus if there are four puffs per boll, that's 28 seeds. Five or so bolls per plant, and we have four, and yes, I can grow a short row next year, which we will do, I think. Although it's important to be careful. Cotton is a heavy feeder and quickly depletes soil of its richness. 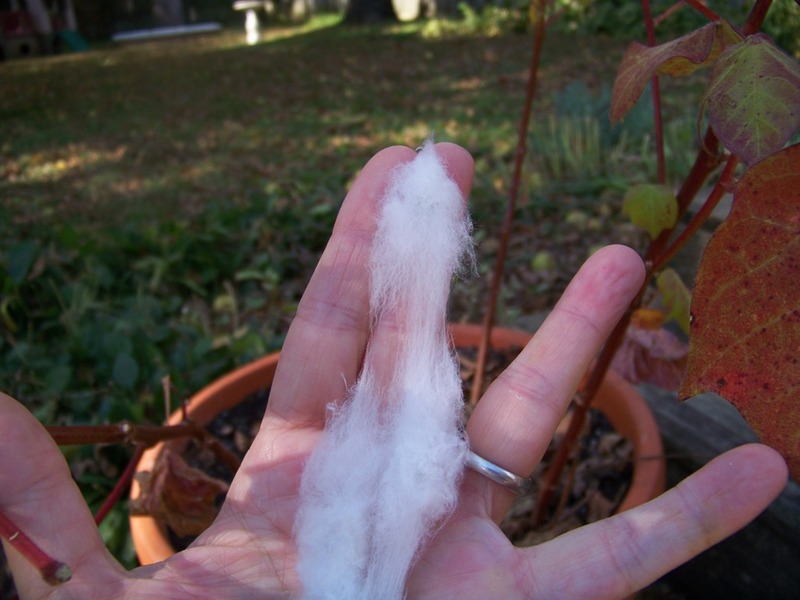 Meantime, we have the softest, cleanest cotton balls imaginable; perfect for little boys' boo boos! The plant looks lovely in the red autumn shade. The color and light this time of year are magical here, as I remember them being in Germany. Rich beyond belief, almost, but with an ache attached, because the gray times come so soon. Funny you should say that about the cat fur. Miss Blueberry Muffin, our long-haired calico, has fur softer than a fox's undercoat; it's unbelievable. I've thought of cleaning and spinning her fur, because a friend of a friend did that with her Golden Retriever dog's hair...and made a really soft hat. Sounds a bit icky at first, but here we wear wool and goat fur, and on the beasts it's pretty nasty, but when cleaned is very nice. What's the real difference after a good soaping?